With our two state of the art manufacturing facilities we can offer quick turnaround time with free shipping throughout the continental United States. Ask about our Bull Rush program for expediting your order. Electrostatically (faraday) shielded transformers are designed to protect sensitive electrical and electronic devices and systems from high frequency voltages (electrical noise) or transients that occur due to switching and loading on distribution lines. Electrical noise and transients are classified two ways: Normal Mode – noise which appears between the hot & neutral conductors. 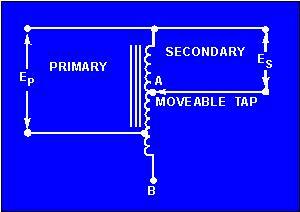 Common Mode – noise which appears between the ground wire and hot and neutral conductors. Common mode noise is more prevalent and should be the key criterion for any noise suppression device. To make the basic single-phase transformer move versatile, both the primary and secondary windings can be made in two equal parts. The two parts can be reconnected either in a series or in parallel. This provides added versatility as the primary winding can be connected for either 480 volts or 240 volts and the secondary winding can likewise be divided into two equal parts providing either 120 or 240 volts. (Note: there will be four leads per winding brought out to the terminal compartment rather than two). Either arrangement will not affect the capacity of the transformer. Secondary windings are rated with a slant such as 120/240 and can be connected in a series for 240V or in a parallel for 120V or 240/120V (for 3-wire operation). Primary windings rated with an “X” such as 240X480 can operate in series or parallel but are not designed for 3-wire operation. A transformer rated240X480V primary, 120/240V secondary could be operated in 6 different voltage combinations. Totally enclosed non-ventilated dry type transformers are for special applications. 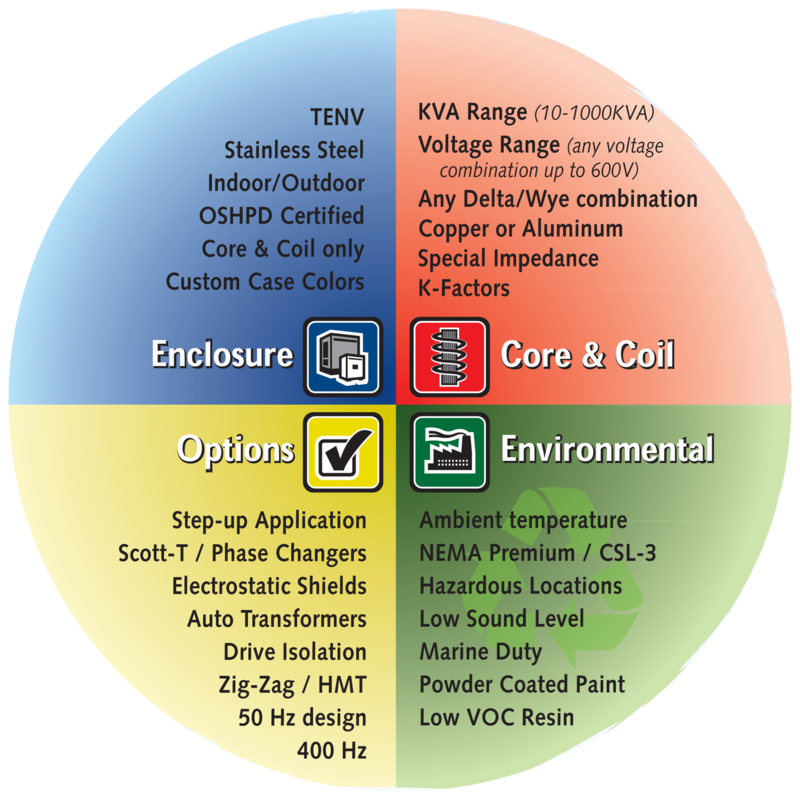 They are used mainly in adverse atmospheric conditions where it is desirable to use a dry type non-ventilated transformer vs. the ventilated standard unit, which has openings in its enclosure to allow air to flow directly over the core and coil. In applications where the atmosphere contains conductive, corrosive, or combustible materials, which might damage a transformer, or lint and dust particles which might block the ventilation passages, the non-ventilated transformer is highly suited. It has no openings in the enclosure. Heat is dissipated by radiating from the surface area of the enclosure. Consequently, the enclosures are larger than those of the standard ventilated type. Non-ventilated transformers are suited for application in the textile, chemical, automotive, electrochemical, foundry, cement, food, paper, and other industries where the transformer is subject to spray or wash down conditions. 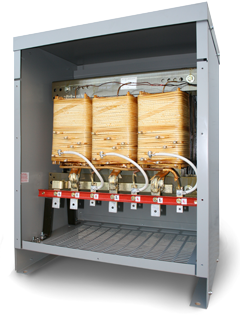 MGM’s TENV transformers are also available in stainless steel enclosures. Need it fast? We can deliver. Emergencies happen and we can expedite the manufacturing of your units to meet your delivery requirements. Ask about our Bull Rush program when you place your order and we can manufacture and ship your unit in as fast as 2 working days!